Don’t believe what other people tell you – rocking chairs are NOT just for old people! In fact, they’re one of the comfiest pieces of furniture out there. Even so, a rocking chair isn’t the most portable seat. Since most of them rely on rockers or springs to operate, they can’t really be disassembled and stored for convenience. The Stargaze Recliner by NEMO Equipment looks to be a different story. It’s a series of chairs designed specifically for the outdoors which swing users back and forth to remind others of their presence. The seats are composed of water-resistant nylon mesh and can hold up to 300 pounds, while aircraft-grade aluminum legs keep the chairs suspended and can be disassembled to fit into a carrying case. 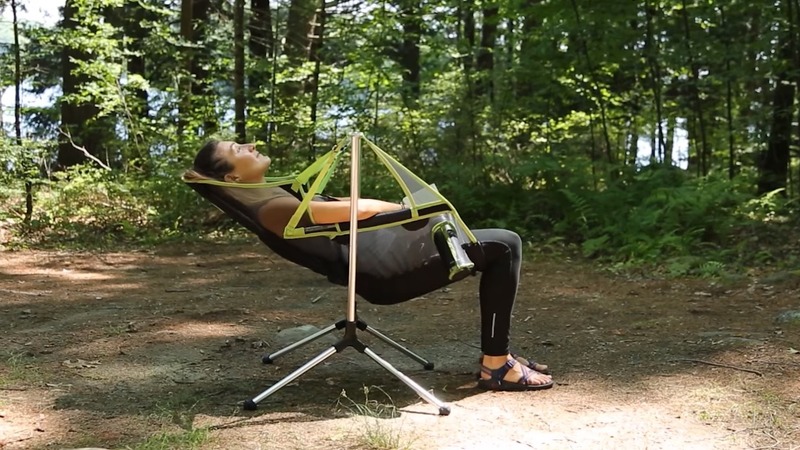 Fans of stargazing and camping can lean back and the seats will adjust themselves accordingly to meet ethereal needs. The elastic bands anchoring the seats to the aluminum legs play a big part in this, as they stretch whenever the user adjusts their sitting position. Apart from the normal version (left), a low-profile design (center) which sits closer to the ground and a luxury variant (right) with an extended headrest are also available. All of them feature armrests (for holding arms), cup holders (for holding cups), and a small pocket (for holding things which aren’t arms or cups). The chairs weigh roughly six pounds each (5 lbs. 11 oz. for the normal version, 5 lbs. 2 oz. for the low-profile version, and 6 lbs. 5 oz. for the luxury version), so portability isn’t really an issue. The chairs cost anywhere from $169.95 for the low-profile variant all the way to $219.95 for the luxury variant. You can find each chair’s specs as well as their pricing here on NEMO Equipment’s webpage.